Condolences to our Taft Prospectors President. His wife Bonnie will be missed at our Meetings and Outings. She is up in Heaven dancing away on these streets of gold. RIP sweet Bonnie. Click Here for some pictures of the 2015 Thanksgiving outing. To join our group you must do so at a meeting or an outing. Our membership of 225 is full at this time but come to a meeting or attend an outing to get your name on the waiting list and we would contact you when an opening is available. You are welcome to be part of our next Outing as a guest and come camping with us. 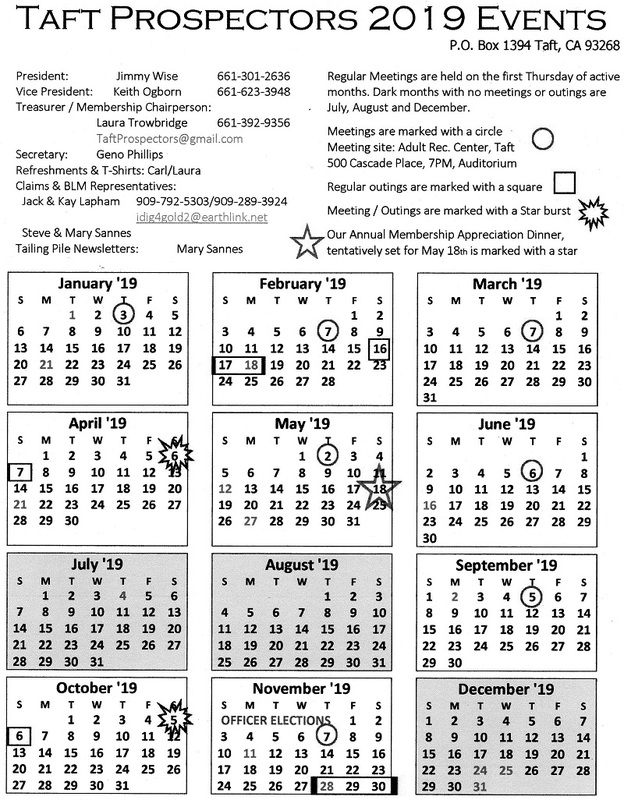 You can check out the 2017 Calendar for dates. Taft Prospectors is a family oriented club with rules that must be followed. Read our Code of Ethics on the Website. Members that do not follow common sense and destroy our claims will get kicked out. Read and know the rules of the Taft Prospectors. At the Outings we have coin hunts, 50/50 drawings Pot Luck dinners and general campfire camaraderie. We do require that you fill your holes. The BLM also requires that you do too. If you don’t fill your holes or make turtle ramps while you are working a hole the BLM can cite you or be drastic and take our claims. Water can be bought in Johannesburg at the water company above the Post Office but the closest place with a dump is the Fair Grounds in Ridgecrest. BLM allows you to stay 14 days in any given 30 day period on our claims before you have to leave. We are fortunate enough to be allowed an “Out House” on the Black Gold #2 Claim for us to use so please help keep it neat and clean. I will be posting more pictures as I get them. TAFT PROSPECTOR'S Code of Ethics: these are the rules that you signed to abide when you joined the Taft Prospector's Club and signed your hold/harmless agreement. Fill your holes. Leave an incline ramp for tortoises and animals when even leaving your digs even overnight. It is the law! You may leave a bucket with your name on it in your digs if you are coming back in a day or so but not unless you are working it. You cannot save more than one spot at a time. Respect where someone else is working. Be aware of other claims in the area that do not belong to us. Don't be claim jumpers. We have 9 claims so that should give you more than enough prospecting space. BLM rules say you cannot burn wood with nails in it so no fencing or pallets. You also need a Federal Fire Permit to have a camp fire. You can get one from the BLM office, the US Forestry or from the Friends of Jawbone Information center. Fireworks are forbidden on the desert. Pick up all of your trash and take it with you. Do not leave glass or cans in the fire ring or any other debris in the fire ring. Please help keep our "Out House" clean and free of debris. We are very fortunate the BLM lets us keep it so let’s not abuse it. Taft Prospector Member's may bring guests but they must work in close proximity to you. You may not give permission for anyone to use the claims without you being with them. The BLM allows you to camp on the Taft Claims for 2 weeks at a time. To go beyond the Red "No Entry" stakes you must carry your current TAFT membership card and this map to prove you have the right to be prospecting on our claims. The Ranger might cite you anyway depending on your attitude and their attitude plus you must be prospecting and not just joy riding. If you get a citation, get the officer's name and badge number but be polite and then contact PLP for advice. If someone approaches you and asks to see your Membership card show it. Proving you have a right to use the claims should not be a problem. You have the right to ask anyone digging or metal detecting on the Taft claims to see their current membership card. Remember that all prospectors may be judged by the example you set. Leave flora and fauna as you found it. Do Not Destroy any property, public or private. Obey the laws. Please do not litter. Take your trash with you. Each member of the Taft Prospector’s should strive to set a good example for others. May your 2015 fill your pan with gold nuggets! Snake Killed on Taft Outing - Watch Out! 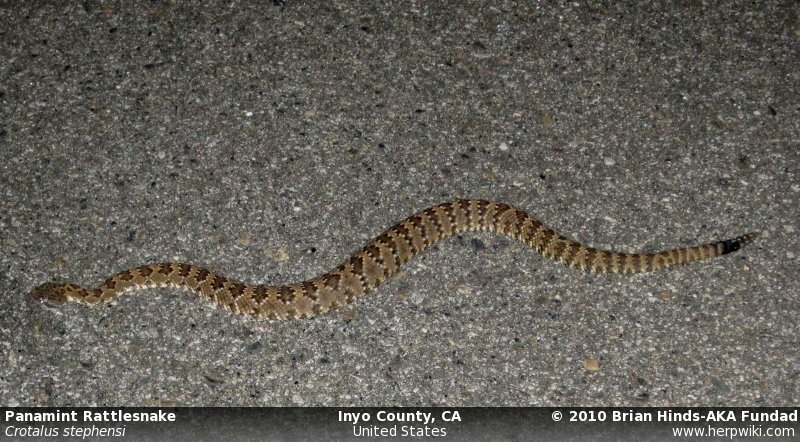 Proper name for the Panamint Rattlesnake that was killed on the Taft Claim is Crotalus stephensi. Thank you to those who identified it so quickly. It also looks like the red form of a Mojave Green, Crotalus scutulatus but the pattern looks more like the Panamint so that is the consensus of opinions. Does anyone know what kind of snake this is? Just before we got to the Taft claim yesterday they had killed an aggressive rattlesnake where we usually park. We have been coming out and camping here for 19 years and never saw a rattlesnake on this claim. The guys cut the rattles and head off and they even had this buried by the time we got here. When they described it I knew it wasn't a red diamond back because they said there were no black & while strips on the tail but even after seeing it, I am not sure what kind of rattler it is. My guess is it was about 20 inches long with 5 rattles on the tail. Any suggestions as to what kind it is? It was called a Red Mojave Green but I could not find one called that on the Internet. The snake really didn't look like the Mojave Greens we have killed. From now on to join The Taftprospectors Club applicants must come to an Outing or a Meeting. We will no longer accept new membership applications by mail. If someone is interested enough to join, they should be interested enough to come to one of our functions. The new membership application will be printed with this information on them to reflect the new policy. If you are on our claims and want to build a fire, You must have or build a rock fire ring. We can get fined and loose our claims if you do not use a fire ring. If it is windy, you can not build a fire. These are not club rules. These are BLM rules. You also need to get a Federal Campfire permit to have a campfire or use a propane or charcoal barbecue or stove from the US Forestry or BLM Office..
You can not burn pallets or fencing with nails in your campfire. Fireworks are not permitted anytime, anyplace on the desert. Those are BLM rules too. May 2014 be peaceful and be full of God's blessings. May the bottom of your gold pan be covered in GOLD!